•	Integrate their existing solutions with external identity providers using Azure AD B2B or B2C. •	Design a hybrid identity solution. •	Determine when to use advanced features of Azure AD such as Managed Service Identity, MFA and Privileged Identity Management. •	Secure application secrets using Key Vault. •	Secure application data using SQL Database and Azure Storage features. •	Detail the various APIs available in Cognitive Services. •	Identify when to use the Face API, Speech API or Language Understanding (LUIS) service. •	Describe the relationship to Bot Framework and Azure Bot Services. •	Determine the ideal pricing option for Azure Storage based on a solution’s requirements. •	Identify performance thresholds for the Azure Storage service. •	Determine the type of Storage blobs to use for specific solution components. •	Use the Azure Files service for SMB operations. •	Identify solutions that could benefit from the use of StorSimple physical or virtual devices. •	Compare and contrast monitoring services for applications, the Azure platform, and networking. •	Design an alert scheme for a solution hosted in Azure. •	Select the appropriate backup option for infrastructure and data hosted in Azure. •	Automate the deployment of future resources for backup recovery or scaling purposes. •	Create a resource group. •	Add resources to a resource group. •	Deploy an ARM template to a resource group Integrate an API or Logic App with the API Management service. •	Design an App Service Plan or multi-region deployment for high performance and scale. •	Integrate an API or Logic App with the API Management service. •	Describe various patterns pulled from the Cloud Design Patterns. •	Distribute network traffic across multiple loads using load balancers. •	Design a hybrid connectivity scenario between cloud and on-premise. •	Design an availability set for one or more virtual machines. •	Describe the differences between fault and update domains. •	Author a VM Scale Set ARM template. •	Identify data streaming options for large-scale data ingest. •	Identify longer-term data storage options. •	Deploy an ARM template to a resource group. •	Filter resources using tags. •	Author a complex deployment using the Azure Building Blocks tools. •	Select between hosting application code or containers in an App Service instance. •	Describe the differences between API, Mobile, and Web Apps. •	Locate and reference the Cloud Design Patterns documentation. 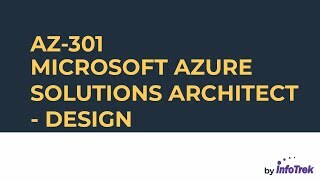 •	Locate and reference the Azure Architecture Center. •	Join a virtualized machine to a domain either in Azure or on a hybrid network. •	Describe DNS and IP strategies for VNETs in Azure. •	Compare connectivity options for ad-hoc and hybrid connectivity. •	Compare Storage Queues to Service Bus Queues. •	Identify when to use Azure Functions or Logic Apps for integration components in a solution. •	Describe the differences between IoT Hubs, Event Hubs and Time Series Insights.